One more trailer and last bit of news rush has come out of the final day of Tokyo Game Show for Tales of Xillia 2. A stage presentation at the event confirmed a variety of things for the upcoming PS3 game, which is set to launch on November 1st in Japan. At the stage event a new trailer was shown featuring both animated scenes from animation studio ufotable and in-game motion capture scenes. It’s been confirmed that, much like Ludger, his brother Julius can transform into his own Corpse Shell mode as well. One of the main conflicts in the game will be the two brothers against one another. A separate trailer featuring pre-order costumes for Ludger, Milla and Jude was shown. A few of the bonuses include Yuri and Asbel costumes for Jude and Milla respectively, along with several other costumes which can be used in Tales of Xillia as well. ToX’s DLC will most likely be available for use in ToX2. New cross over promotions have been announced, including Tales of Xillia 2 x Madoka Magic DLC costumes and attachments for the female characters. Unfortunately, Elle won’t be able to wear any costumes – she’s strictly a non-player character. 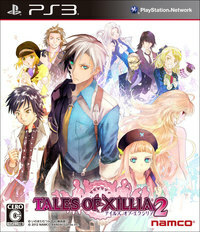 Producer Hideo Baba hinted toward even more playable characters, with the possibility of Gaius from the original Xillia. Ayami Hamasaki’s new theme song is titled “Song 4 U” and will be released alongside the main OST on November 2nd. In other merchandise news, Tales of Namja Town and Tales of Café are making a return. The latest Tales of Magazine will feature Ludger and Elle and is due out in November and will include a bridge story connecting the two games. A manga has also been announced, which will debut in the December issue of Dengeki Maoh on October 27th. Other merchandise such as shirts and various clothes items are on their way as well. Baba also confirmed a Tales of Xillia 2 Talk Show and an Amlux x Tales of Xillia 2 collaboration are in the works. Be warned: the new trailer has a load of spoilers, so of course watch at your own risk.